At the 2014 Pebble Beach Concours d’Elegance, Saleen introduced its remarkable work of engineering, Saleen FourSixteen 2015. 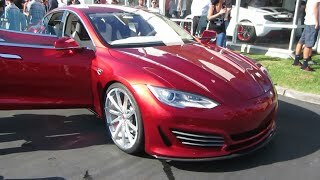 The model is based on Tesla S Model and is created to portray what company is good in; creating a gorgeous racing vehicle. 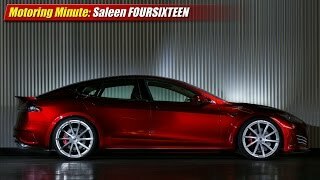 Let us have a look at the Saleen FourSixteen 2015 review to find how far they succeeded. The interior of Saleen FourSixteen 2015 will take you over a roller coaster ride with its supercar-like look. The four-seater car is housed with bucket seats for all four passengers and comes drenched in black leather with accents of perforated leather and Alcantara suede inlays. The dual tone interior looks remarkable with its smooth surface and perfect selection of colors. Three-spoke steering wheel sits affirm in front of innovative instrument panel while the center console gets a new revised look and provides additional storage compartment for driver and front passenger. Complementing the bolstered bucket seats, their shells have been matched with black leather adding luxurious serenity to the interior of Saleen FourSixteen 2015. Exterior of Saleen FourSixteen 2015 is remarkable work of innovation that brings to you looks and performance contribution both. Starting with the front end you’ll notice aero management vents that looks stunning and helps in performance by maintaining low pressure field around the chassis. To support the vents hood has been crafted in V-shape which generates downforce and directs hot air away from the cooling system. Marching towards the rear end of Saleen FourSixteen 2015, company has mounted a spoiler over the decklid. The experts also contributed to performance by adding carbon fiber accents across which the mid-chassis air gets directed. 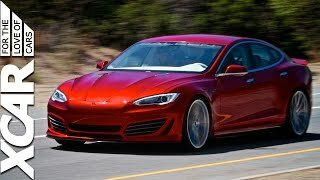 In all the exterior of Saleen FourSixteen 2015 isnt just created to look sporty and luxurious but each and every part has been closely studied and crafted, so as to add to the performance of electric car. 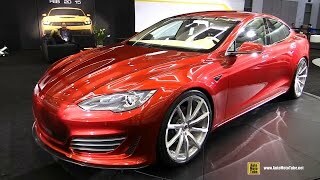 The electrified Saleen FourSixteen 2015 gets its power through a 3-phase, four pole AC induction motor and copper rotor. The system gets adored with 11.39:1 final gear ratio which is part of upgraded Saleen drivetrain. Apart from these track capable throttle response, torque management and MAXGRIP locking differential adds to overall performance and make the performance of Saleen FourSixteen 2015 filled with powerful figures, sound and better control.